Commerce, communication, and connection are the probable cause for the rise of cities. The earliest gatherings of permanent homes were around fortifications for protection, so they tended to be in places hard to approach. A steep hilltop, an island, a peninsula, or any site with only one defensible approach. Any coffee table book about castles will show that the real ones were placed intentionally off the beaten track. But a fortress with a village is not a city. Real cities cropped up on river banks or harbors or passes – anywhere that the flow of human interaction could enable people to do more than just survive. Awareness is the payoff of city life. It comes from being connected to developments in culture and the ways people live their lives. that’s a big reason for the powerful interest in the condos for sale in Midtown Atlanta. Businesses are built on this everyday connection. Commerce consists of making and exchanging things that are useful in people’s lives or offering services that make those lives more efficient, effective, and enjoyable. So it was inevitable that the great cities of the world arose in places where oceans or rivers or roads brought people together. Atlanta was born on a crossroads, in the era when rail travel revolutionized trade and industry. Today, the popularity of the Atlanta condo and particularly the luxury condos at Atlantic Station can be traced to this firm foundation of why people increasingly prefer city living today. Yes, the urban migration is not just an Atlanta thing, it’s being seen around the globe. As economies and livelihoods increasingly depend on innovation and service, the opportunities people seek become more and more city-based. Communication and connection – and the awareness that arises from them – are basic elements of growth for today’s economy. As such they are career necessities for today’s business leaders. But the line between city and suburb is no longer so easy to see. What once were Atlanta’s suburbs today take an increasingly an active part in the urban scene. In this, Atlanta is again at the forefront of a trend so solid and broad-based that we see it across the globe. True, there are fewer smokestacks to flee from, in choosing a suburban life. And in addition, there is less loss of connection, as the preferred suburbs become integral to the urban scene. 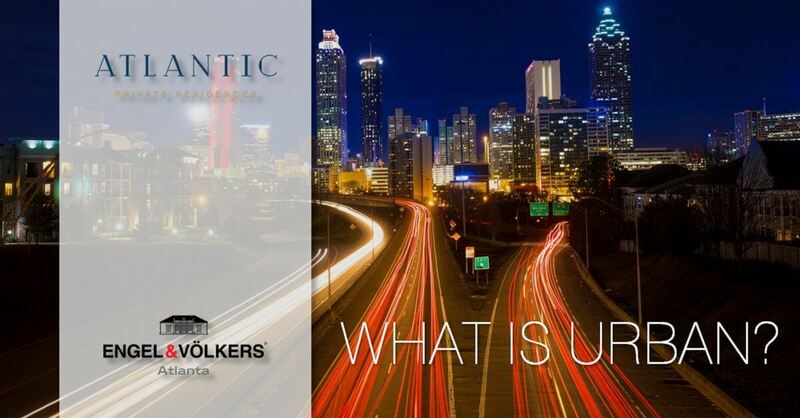 Engel & Völkers is known as the Atlanta leader in the sale of residential real estate and new developments. We’d be happy to share some more of the reasons for the growth and value that’s exemplified in the condos for sale in Midtown Atlanta. Just call us at 404-845-7724 or find out more at evatlanta.com.